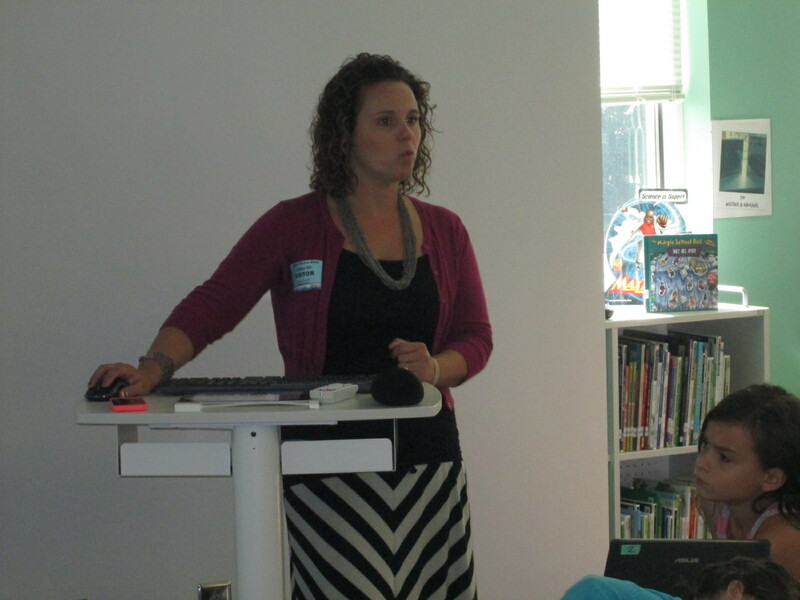 Lindsey Hill, educator superstar from Evanced Solutions, visited our library to help us with goal 4 for the library this year, “Supporting the reading habits and curiosities”. In fact, this goal is so important that it is a part of our school improvement plan. We believe that one of the best ways to become better readers is to read, read, read. More importantly, we believe that finding books that we are interested in that match us as readers is an essential part of building stamina as a reader. This year we are piloting a tool called Wandoo Reader to see how it supports us in tracking our reading habits and curiosities. This tool is still in development for schools so we are figuring out what works well and what needs to be adjusted. Wandoo reader is a “game and a reading tracker”. It follows the story line of a robot who stumbles into a library but is low on power. In order for the robot to power up, the robot needs kids to read books. Students read books or really anything of their choosing. In the online reading log, students submit the reading material title, amount of time read, and whether or not they finished reading the material. 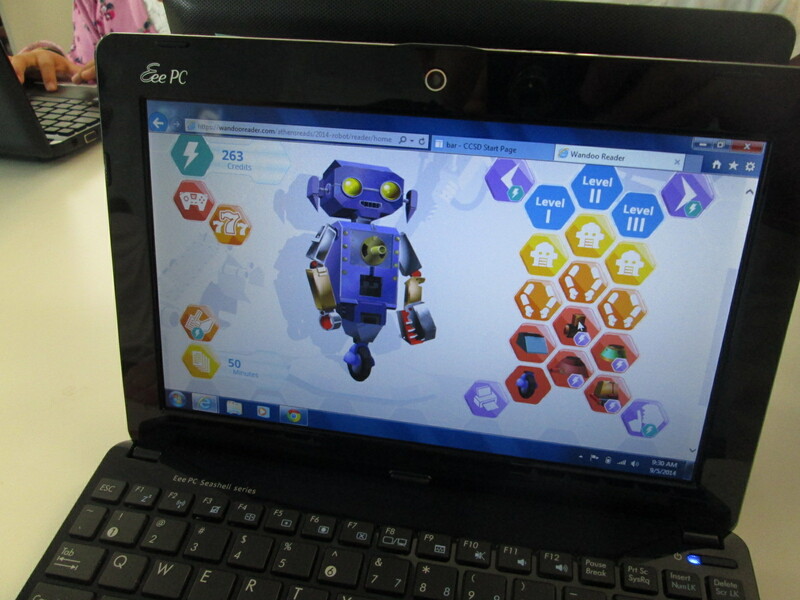 Each time they log reading, they earn credits which allows them to purchase parts to the robot. There are over 8,000 combinations of parts, so it’s pretty difficult for students to ever be truly “finished”. 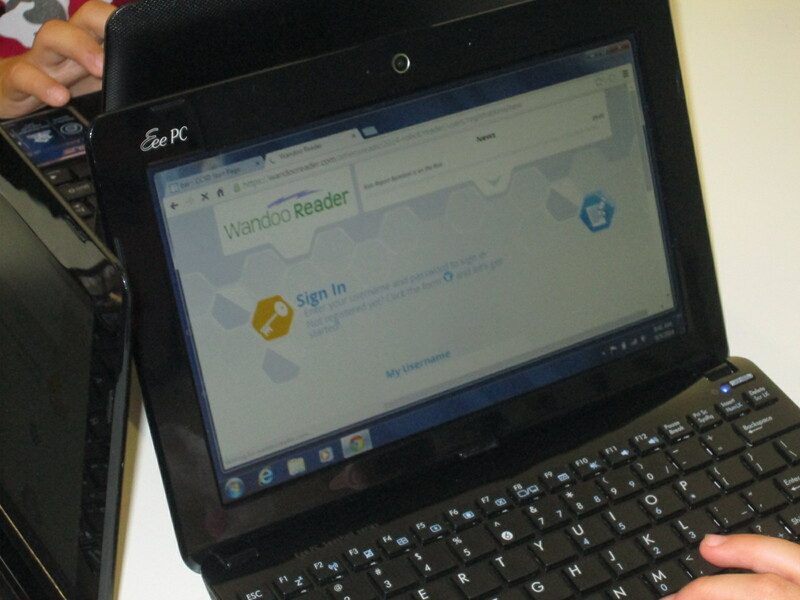 Wandoo Reader also allows the administrator to setup incentives or prizes as well as secret codes for completing various challenges. 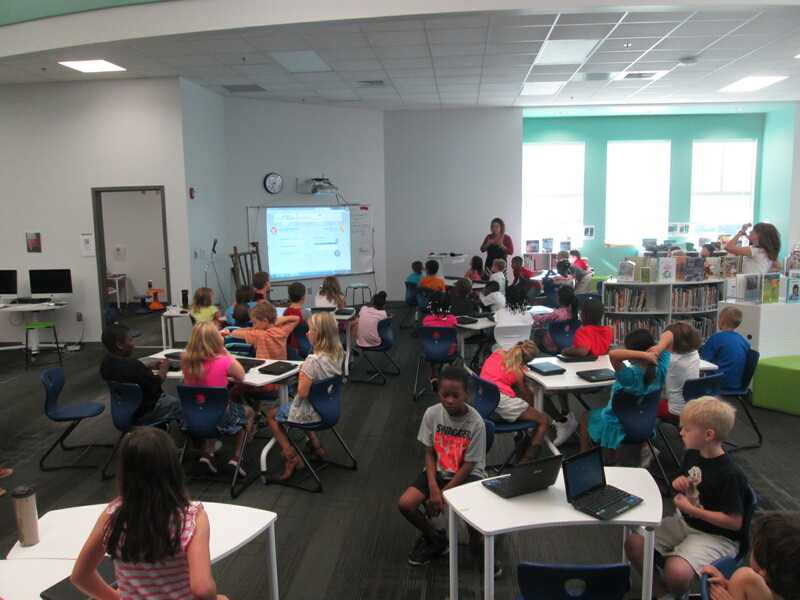 Our goal for Lindsey’s visit (and next week) was to get all of our 3rd-5th graders setup with accounts in Wandoo Reader. Lindsey and I met with many classes. I kicked off each session by sharing the news with students that we are the only school in the world currently using Wandoo Reader. I wanted to emphasize the potential in this. I brought in a conversation about empowering student voice in this opening (goal 3 for this year). Students have an opportunity to test out a tool, figure out what they love, get frustrated with what doesn’t work, and point out what they just don’t like. Each observation or failure that they make goes directly to Evanced Solutions for consideration in improving Wandoo Reader for future schools, so our student voice really matters and makes a difference. 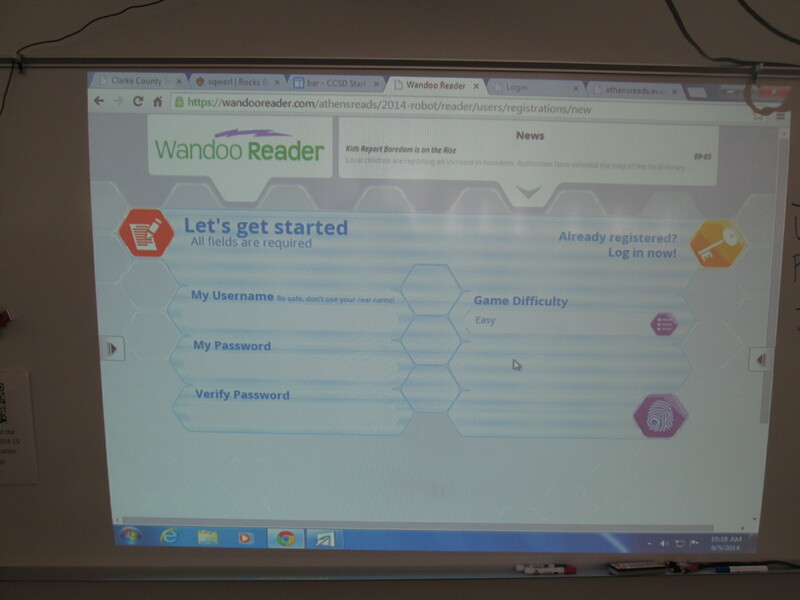 Lindsey did a demo of what Wandoo Reader would look like once students registered. 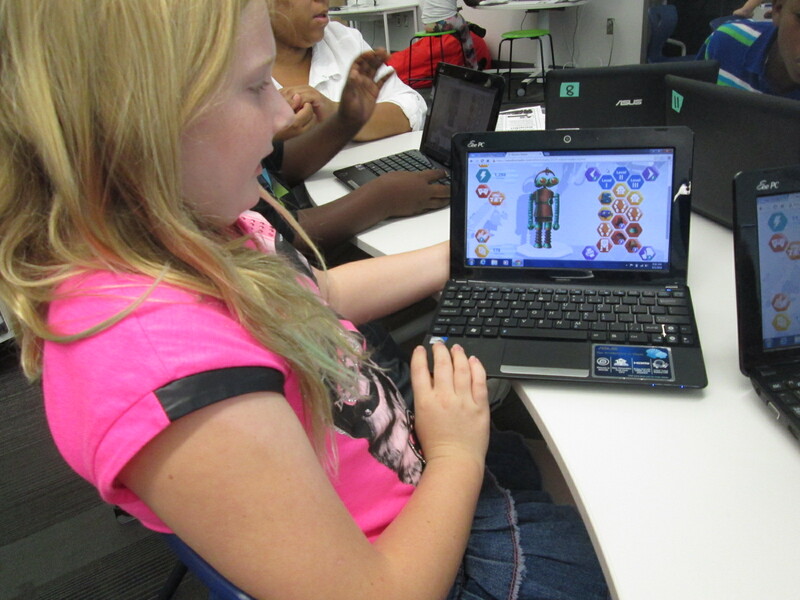 She show them how to log their minutes, how to earn credits, and how to purchase a robot part. Then, we started the long process of getting students registered. It didn’t take us long to discover that this process is not quite ready for schools and will need some adjustment. 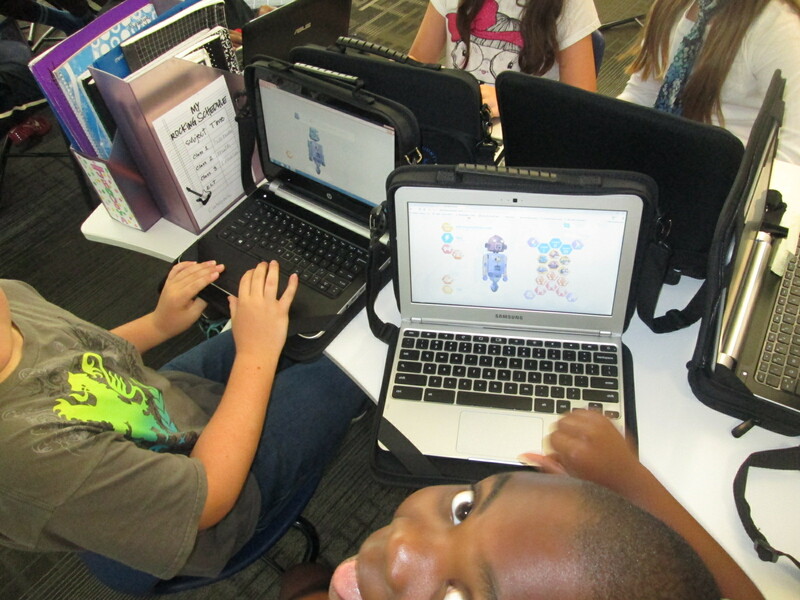 Each student had to create a username, password, confirm password, and select the difficulty level for the game. Then, students had to type my email address to send an email confirmation. Each email had to be clicked on to activate each student account before they could proceed. Bulk uploading is already in development and it is essential for schools to have this feature because the wait time students felt while I clicked on each email was too long. 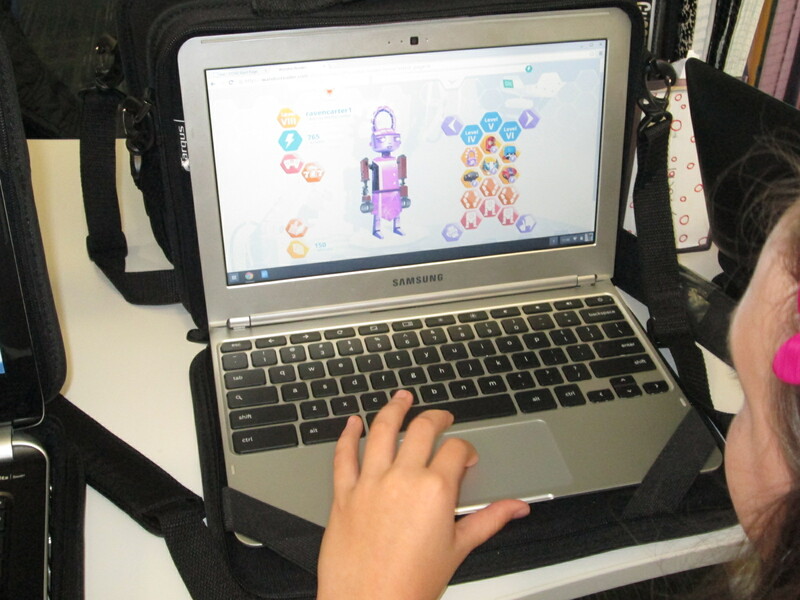 Once students have accounts activated, Wandoo Reader takes them through a tutorial which reveals the story line of the game and shows students the different buttons they will click to log reading, purchase parts, build a robot, etc. This tutorial is text-only for now. 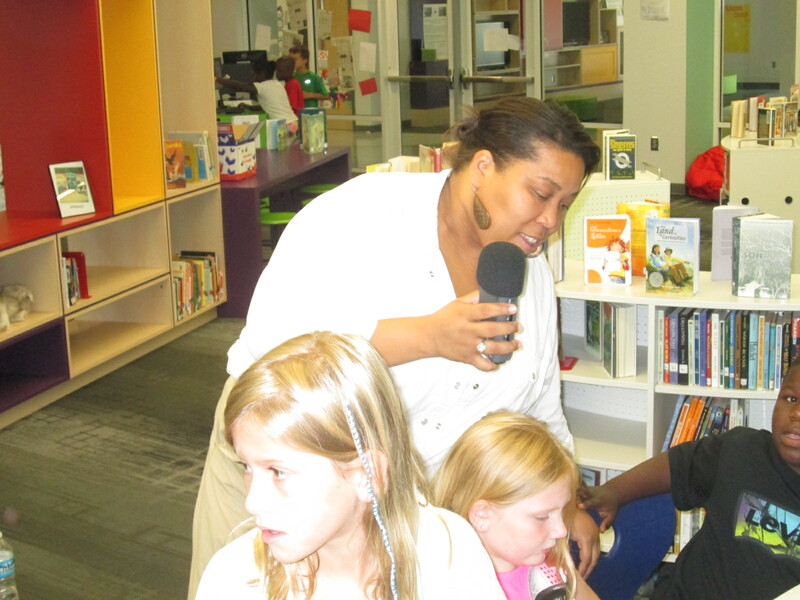 Some students read every word, others clicked through without reading at all, and others really tried to read but got frustrated without the support of audio or an adult’s help. Again, this was an area where students and teachers offered feedback about their experience and observations and would really love to see an audio feature or simpler text. 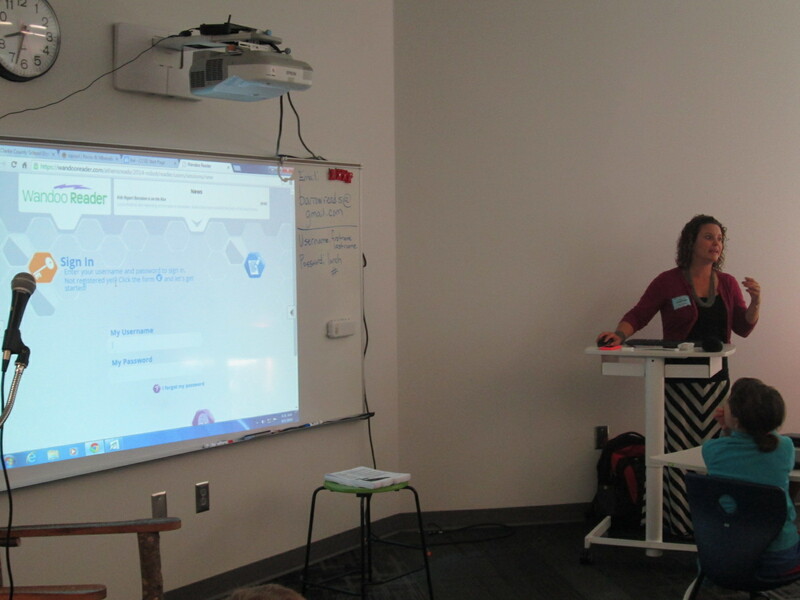 After the tutorial, students come to another screen where they have to put in their name, birthday, zip code, gender, and select their teacher. There was a lot of learning here for students because it revealed that most students had no idea what a zip code is. It was a great lesson, but it did slow down the registration process. Our suggestion for this page was to cut out much of this page. The essential information is the student name and the teacher. These are the two pieces that will be used the most when running reports for data from Wandoo Reader. 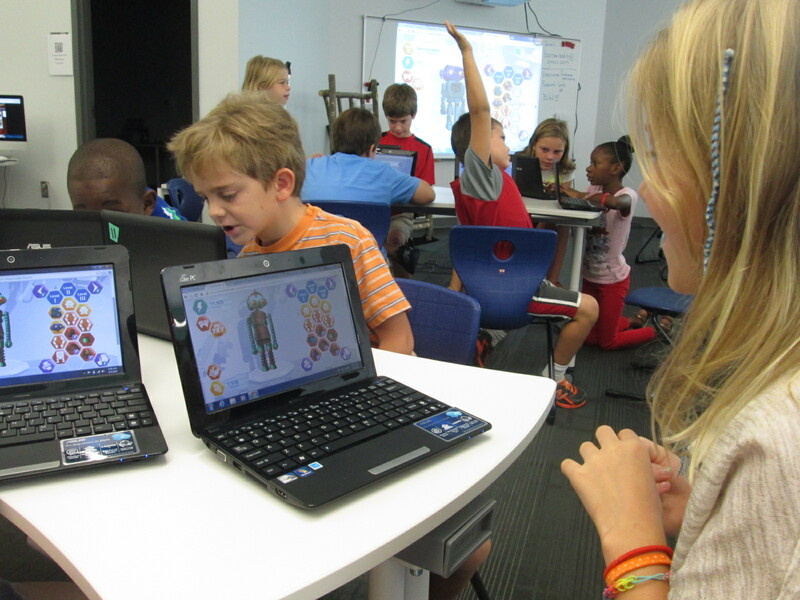 Students were really engaging in goal 1 from the library this year, “dreaming, tinkering, creating, and sharing”. Of course, some students started testing the system to see how many points they could earn for more parts. We can always clear that out through the administration portal, but they had permission to tinker. They figured out how things worked, how things didn’t work, and also revealed to us what Wandoo Reader might need in order to focus kids on the true goal of the tool which is increasing student reading ability. We closed our time by talking about the importance of the data that Wandoo Reader will produce for our school. I gave specific examples. For example, if I see that a student clicks “still reading” on multiple books and never clicks “finished reading”, it might reveal to me that the student isn’t finding a good match for reading. If a student reads the exact same book over and over, it might reveal to me that I need to have a conversation with that student to find similar books to the trusted favorite. If I notice that several students are reading a lot in a particular genre, it might reveal to me that I need to purchase more of that genre for our library collection. The list could go on and on because the data that Wandoo Reader can produce for me as the librarian as well as for classroom and collaborating teachers is something we have never had access to in a single location shared across the school. If kids use it with “fidelity” as our superintendent says, then we can start to notice and really pay attention to the amount of time that our students are spending reading. If we want to close the achievement gaps in reading, then one of the most important steps is getting the right books in kids’ hands and giving them time to read and have fun with that reading. Wandoo Reader has great potential for this. Looking back over the day, there were many frustrating moments in the registration process. In fact, there were times that it was that level of frustration where you just want to say “no thanks” and move on. For students, there were moments where meltdowns, shut downs, and giving up could have happened. However, the thing that sticks out to me most about the day is that there weren’t any tears. Not a single student gave up. I won’t pretend that they didn’t get frustrated because they did. However, it is more important to me to see what they did with that frustration and it makes me ask “why?”. Why didn’t they crawl under tables, cry, close their computer screens, or say I don’t like this? I can’t prove why at the moment, but I can’t help but wonder about the library goals for this year. 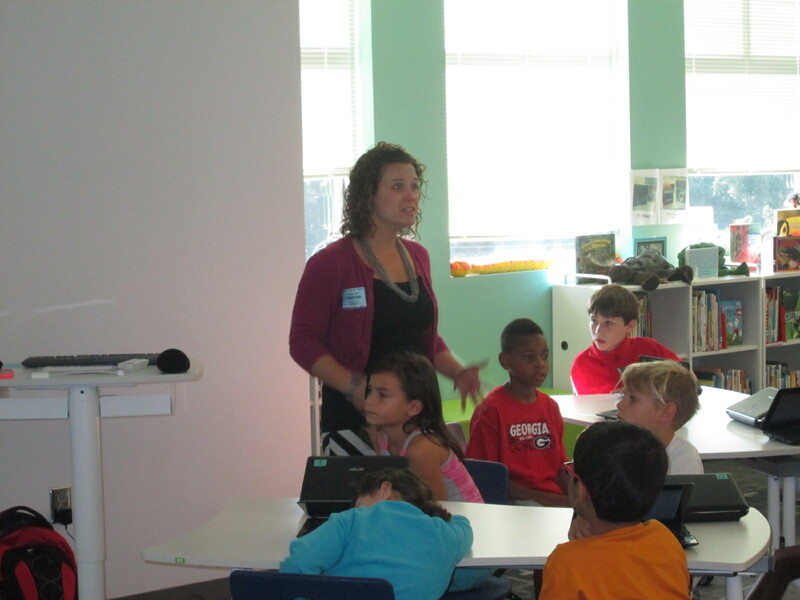 We began each session by giving students permission to tinker and fail (goal 1 dream, tinker, create, and share). We established a sense of purpose by helping them realize that their failure and feedback was contributing to the greater good of the world (Goal 2 global thinking & collaboration). We empowered them to notice what wasn’t working as well as what they loved and share that into Lindsey’s recorder to take back to the developers (Goals 3 empowering student voice). We talked about reading multiple kinds of text and logging everything and even gave them permission to log Wandoo Reader as a book (Goals 4 supporting reading habits). When I started the day, I really didn’t plan for every library goal to be evident in this one lesson. As we moved through the first session, it became very clear to me that I needed to be transparent with students about the multiple layers of why we were using Wandoo Reader. When I did that, the library goals naturally came to life because they are a part of my thinking every day. If I can continue to replicate experiences like today, I feel like our students will continue to develop perseverance and stamina as well as feel like their voice matters in our school as well as the world. 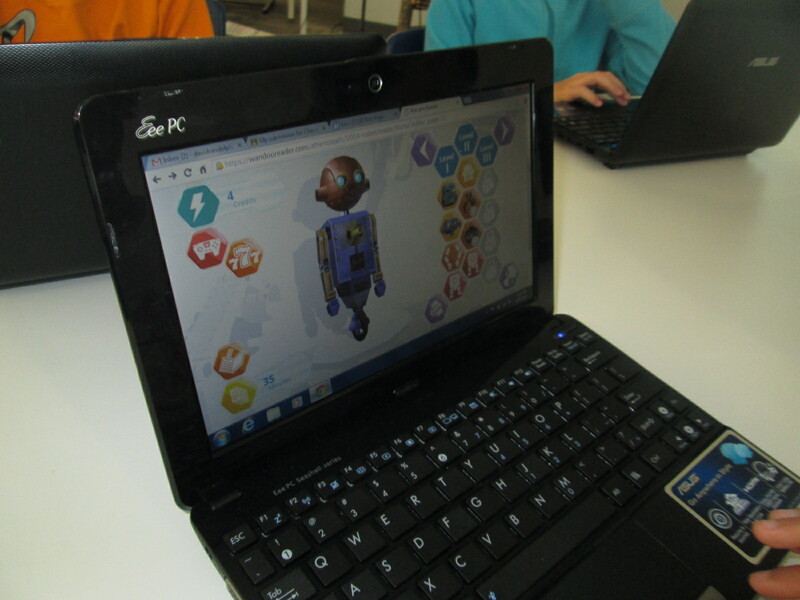 Now the students who are setup are ready to start logging everything they read and building robots. I told them to not worry about what they have read in the past but instead start with what they are reading right now. 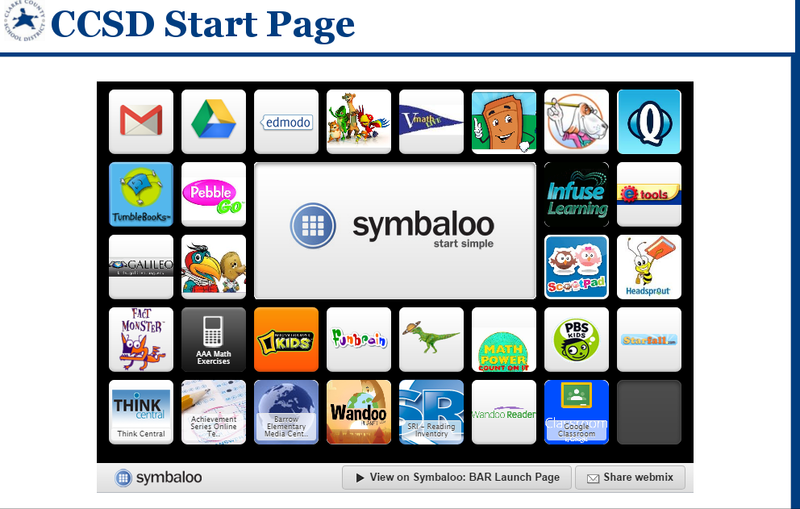 Many will probably log minutes this weekend by visiting our Symbaloo page where we keep all of our resources. Others will start logging minutes at school next week. Regardless, the task now is to continue to tinker for a bit until we all figure out the best process for having kids log their minutes. I will also follow up with teachers to see how they are feeling about Wandoo Reader and see what our next steps really are. Even with the frustrations of registration, I feel like we all gained so much from this day to support us throughout this school year. Thank you Evanced for this opportunity, and we can’t wait to see the changes to Wandoo Reader based on what was learned from these first student users. This entry was posted in Advocacy, Lesson, Reading Promotion, Reflection and tagged achievement gap, evanced, failure, global thinking, goals, library goals, perseverance, student voice, Wandoo Reader.